The RBSP spacecraft are designed to fly and operate in the heart of the most hazardous regions of near-Earth space to collect crucial data. The data will help researchers develop an understanding of the Van Allen radiation belts, two rings of very high energy electrons and protons that can pose hazards to human and robotic explorers. "At the end of this month we will turn our attention from planet Mars to planet Earth, both immersed in the atmosphere of our sun," said Barbara Giles, director of NASA's Heliophysics Division. "RBSP will further explore the connection of solar variability and its impacts on Earth's radiation belts." RBSP will help scientists understand how the invisible radiation belts -- named for James Van Allen, who discovered them -- behave and react to changes in the sun, thereby contributing to Earth's space weather. Space weather is caused in great part by the sun's influence on Earth and near-Earth space, including solar events such as giant eruptions of solar material called coronal mass ejections. "The dramatic dynamics of Earth's radiation belts caused by space weather are highly unpredictable," said Barry Mauk, RBSP project scientist at the Johns Hopkins University Applied Physics Laboratory (APL) in Laurel, Md. "One of the fundamental objectives of the RBSP mission is to use Earth's magnetosphere as a natural laboratory to understand generally how radiation is created and evolves throughout the universe. There are many mysteries that need to be resolved." Space weather fluctuations can increase radiation exposure for pilots and passengers during polar aircraft flights. They also can disable satellites, cause power grid failures, and disrupt the Global Positioning System, television and telecommunications signals. Understanding the science of space weather will lead to better space weather predictions, which in turn will allow us to better manage and protect our technological infrastructure in space and on the ground. 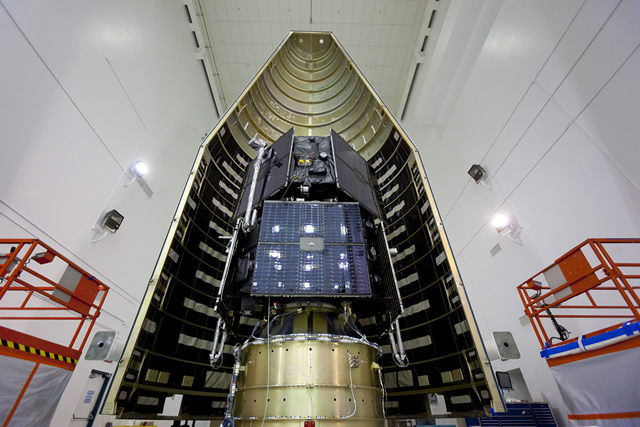 The spacecraft are atop a United Launch Alliance Atlas V rocket currently being prepared to lift off from Cape Canaveral Air Force Station, Fla.
"Everything is ready and prepared for RBSP to launch as scheduled," said Richard Fitzgerald, RBSP project manager at APL. "Both the twin spacecraft and the entire RBSP team are eager to begin their exploration of one of the most dangerous parts of space near our planet." The mission will last two years. The spacecraft, carrying the best and most comprehensive instrumentation ever sent into the radiation belts, will fly through surging and swelling belts of energized particles that would damage ordinary spacecraft. By using a pair of probes flying in highly elliptical orbits, scientists will be able to study the radiation belts over space and time, learn how particles within the belts are produced and behave during space weather events, and what mechanisms drive the acceleration of the particles. RBSP is part of NASA's Living With a Star Program to explore aspects of the connected sun-Earth system that directly affect life and society. LWS is managed by the agency's Goddard Space Flight Center in Greenbelt, Md. APL built the RBSP spacecraft and will manage the mission for NASA.